OpenBSD comes with a web server called httpd, which was based on relayd. 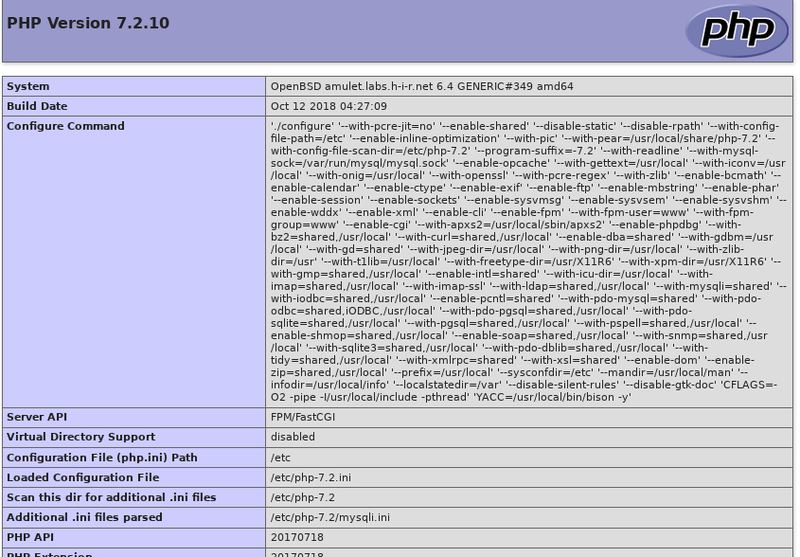 We're going to tackle setting up OpenBSD to serve "LAMP" (or would it be OHMP?) web apps with the built-in httpd, MariaDB (a MySQL fork in OpenBSD Ports) and PHP-FPM. As of October 24, 2018, this guide has been updated for OpenBSD 6.4. It was tested on the amd64 architecture. It will likely work on i386, sparc64, arm64 and others, but package version numbers may vary slightly. OpenBSD no longer includes sudo in the base install. It's still available as a package if you must use it, but we'll be making use of the replacement doas(1) tool, which is similar to sudo in several ways. Create a file called /etc/doas.conf. The man pages for doas and doas.conf are quite helpful, but as a quick and dirty way to get up and running with doas, there's a minimal doas.conf file below. You can also add "nopass" after "permit" if you don't want to be prompted for a password. I don't recommend doing that to a production environment. You will be prompted for which version of PHP you want to install. Unless you have a good reason not to, it's best to go with the newest (highest version number) available. 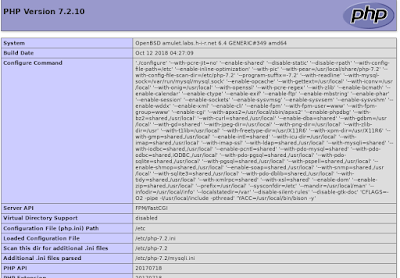 In OpenBSD 6.4, that's PHP 7.2.10. Enable php-mysqli by symlinking the sample mysqli.ini to the /etc/php-7.2 directory. With the new php-7.2 packages, php-fpm has a new configuration structure, and it won't even start without a little manual intervention. It has an include directive for /etc/php-fpm.d/*.conf for the FPM pools, but that directory doesn't exist, and no default pools are defined in the base php-fpm.conf. Since the web environment is in a chroot restricted to /var/www and the MySQL socket is not inside /var/www, the easiest way to get database access is to create your MySQL users for a host of "127.0.0.1" instead of localhost. This forces MySQL connections over TCP. There are some complicated ways of getting the socket into /var/www, such as forcing MySQL to write it inside /var/www or creating hard links to the socket. Those are beyond the scope of this article. My first test was a simple PHPInfo file saved as index.php. I've managed to install various pre-packaged content management systems and my own PHP web sites on OpenBSD's httpd without any problems. Some apps (like OwnCloud) seem to require some extra work. I have managed to get WordPress working with pretty permalinks as well.